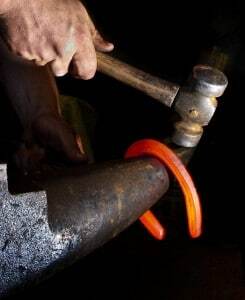 Working with iron is a main part of a farrier’s job as they bend or make horseshoes, but not the only part of the job. And this is where farriers are distinguished from blacksmiths. Where a blacksmith will work with iron and make horseshoes (among other things), farriers smith horseshoes as well as take care of horses’ feet, functioning as both blacksmith and veterinarian. Horseshoeing is a big part of the job. 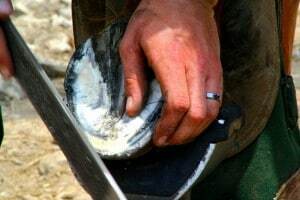 Since domesticated horses often need horseshoes because their hooves are not as hard as wild horses, farriers have to make or bend existing horseshoes to custom fit a horses’ hooves. They will use either the cold shoe (bent when cold) or hot shoe (heated in a forge), methods of blacksmithing. Horseshoeing involves removing the old shoes, trimming the hooves, measuring for the right fit and bending the shoes to custom fit the hoof, then applying them. Since most domesticated horses stay in the same confined spot for much of the day, they’re tramping over their toilet, which causes their hooves to get dirty, potentially harming a horse’s health. To prevent ill health, farriers clean the dirt from horses’ feet, cut out any excess from the hoof wall, dead sole, and dead frog. Using tools like rasps and nippers, farriers also trim hooves so that the hooves keep their proper shape and length, ensuring that the horse maintains good balance. Since farriers work so closely with horses, they also observe them to watch out for any diseases or illnesses that are occurring in the horse. They keep an eye out to see if the horse is dealing with any potential lameness and take corrective action before the issue becomes a real problem. Maintaining proper hoof health is essential to a horse’s well-being. 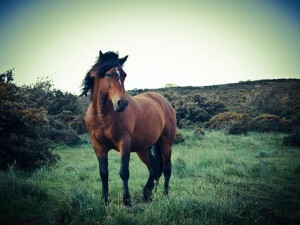 As specialists in equine hoof care, farriers play a vital role in a horse’s life. Skilled farriers are in high demand because attentive horse owners know the important role they play in their horse’s health and appreciate the work they do. I am trying to translate to English the estate inventory of my 4th great grandfather from Sweden. One item among farrier tools is loosely translated as a “fitting iron”. Can you guess what that might be and direct me to a picture? Thanks for your question, Pono. I found one article that refers to farriers fitting car tires onto rims once upon a time: Fran Jurga’s Hoof Blog I’m not sure if that’s the right “fitting iron” though. Let me ask around.